Lutsk (sometimes spelt as Lutzk or Luc’k, also known as Łuck, in Polish) is the main city of the historic region of Volhyn, (Volhynia), now in the western Ukraine. One of the ancient cities of Ukraine, Lutsk is mentioned as the capital of an independent principality as early as the last decades of the 11th century. Lutsk was under Lithuanian rule in the 14th century and later on it was incorporated into the Kingdom of Poland. In 1569 Lutsk became the capital city of the Volhynia Voivodship (Wojewodztwo) within the Kingdom of Poland. The beginnings of the Jewish settlement in Lutsk can be traced back to the 13th century. It was during the same period that a Karaite community also settled in Lutsk. A number of royal charters granted by King Sigismund I (1506-1548) of Poland to the Jews of Lutsk in the early 16th century record two wooden synagogues in the city serving the Rabbinic Jewish and Karaite communities, respectively. Following the destruction of the previous wooden synagogue in a fire, King Sigismund III (1587-1632) of Poland conferred the local Jewish community the right to erect a stone-built synagogue on May 5, 1626. The right was granted on condition that the synagogue should be constructed as a fortified building and that the community should maintain at its own expense men-at-arms and a cannon. The local Catholic clergy strove to reduce the privileges granted to the Jewish community by the king and as a result of protests made by local Dominican friars, work on the synagogue ceased for two years. The Dominicans objected to the proximity of the synagogue to their house of worship and complained also that the structure of the synagogue would be higher than their church. However, King Sigismund III confirmed again the rights of the Jews and permitted them to construct a synagogue whose design and massive dimensions turned it into a veritable fortress. 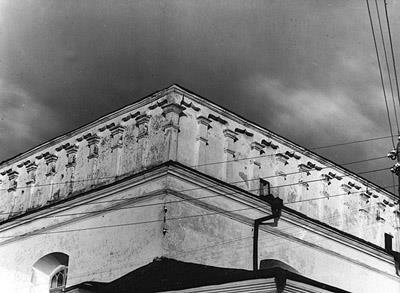 Soon after its consecration, the synagogue building played an important role in the defense of Lutsk against the attacks of the Cossacks in the years 1648-1649. Soldiers paid for by the Jewish community of Lutsk were also active in other battles fought by Polish forces against the Ukrainians during the same war. The Great Synagogue of Lutsk was located in the old town of Lutsk. Established on an island formed by the junction of the river Styr with the river Gizhtza and a number of channels that had been dug to make it more defendable, the old town was fortified in order to resist assaults from Tatars and other invaders. It is believed that the tower of the synagogue building was initially part of the town fortifications originally built in 1380 by Prince Witold, known also as Vytautas the Great, Grand Duke of Lithuania and Prince of Lutsk (1378-1389). The right to use this tower as a place of worship was granted to the Jewish inhabitants of the town by King Sigismund III of Poland. To make it more defensible, a tunnel connected the building of the synagogue to other important structures in the old town, including the Catholic cathedral, a Greek Orthodox church, the residence of the regional governor (wojwoda, in Polish), and the regional court. This underground passage linked the fortified part of the town with its outer districts and was used during sieges to supply the town’s defenders with food and ammunition. The building of the Great Synagogue of Lutsk is typical of the “fortress type” of synagogue built in various places in Poland, especially in the towns of the south-eastern border regions, from late 16th century to the early years of the 19th century. Best examples of this type of synagogue include the Old Synagogue (Stara Boznica) in Krakow (originally built in the 14th century and redesigned in the 16th century), the main synagogues of Brody (17th century), Lancut (18th century) and Zolkiew (now called Zhovkva). 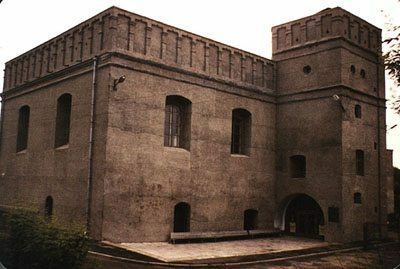 Essentially, the synagogue of Lutsk was constructed as a massive four-pillar stone building with a rectangular plan and an adjacent tower. Its thick reinforced walls contributed to the strength of the structure and supported the roof that in an emergency could be used as a platform for firing a cannon. 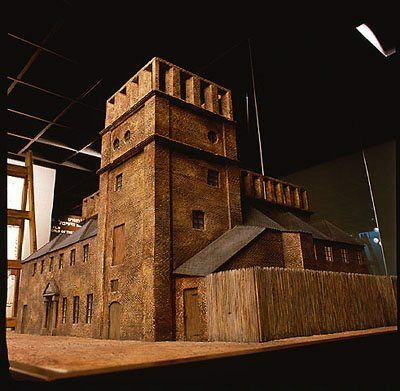 The tower was located at one of the building corners and served as an observation point enabling easier observation and communication during battle. The top storey of the main building of the synagogue as well as of the adjacent tower featured a blind arcaded balustrade running around all four walls. This motif, typical of Polish Renaissance buildings, was adopted for the decoration of many fortress type synagogues: besides its ornamental value, it afforded protection to those on the roof of the building. The interior of the synagogue was dominated by a massive bimah located at the center of the prayer hall. The bimah was surrounded by four pillars that supported the vaulted ceiling and divided it into nine bays. Most of the interior walls of the main prayer hall were covered by murals with plant and animal motifs as well as quotes from prayers. The synagogue of Lutsk housed an important collection of historic documents and valuable items of Judaica . The renowned author and folklorist S. Ansky (1863-1920) took a number of important items from the Judaica collection in the Great Synagogue of Lutsk for an ethnographical museum of the Jewish people that he hoped to establish in St. Petersburg, Russia. The Great Synagogue of Lutsk was badly damaged in a fire in 1869; it took local Jews more than 15 years to raise the funds necessary for its restoration. Renovation work on the interior and exterior and general refurbishment were completed in 1886. 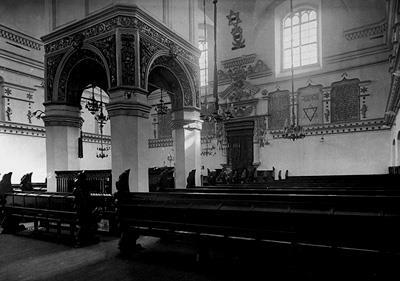 The Great Synagogue of Lutsk continued to serve the local Jewish community during the first half of the 20th century, when Lutsk was again incorporated into Poland. The German occupation during WW2 brought about the destruction of the Jewish community of Lutsk at which time the Great Synagogue suffered damage. After the war the synagogue building was repaired and it stands to this day although it is not currently in use as a place of worship.